We were shocked at the statistics that Great Britain has lost 96.6% of it’s hedgehog population in the last 70 years. We have never seen a hedgehog on the site, but then we tend not to visit after dark !. We are considering approaching a wildlife rescue centre to release hedgehogs on site following their recuperation, but this would be unethical if we have a population already resident at the Headstocks. This is where you come in – we would value your reports of any recent sightings of hedgehogs on or around the Headstocks nature reserve. We are also in the process of liasing with Nottinghamshire Wildlife Trust for help in surveying methods for this species. It is vital that we prevent hedgehogs from becoming extinct both locally and nationally, which is a very real possibility. Sadly the 2019 festival has been cancelled. 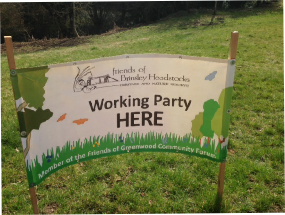 The Friends would like to thank all the individuals and community groups who supported them in past years. 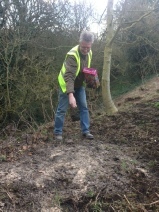 Volunteers have been busy preparing and planting selected sites around the Headstocks with wildflowers. Thousands of seeds were scattered in the bid to create a stunning display of indigenous plants later in the year. 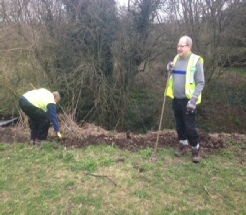 The Friends working party also took the opportunity to clear footpaths and carry out a litter picking sweep of the whole site. Among upcoming projects for the group is a plan to install new interpretation boards to explain to visitors the significance of the Headstocks site.